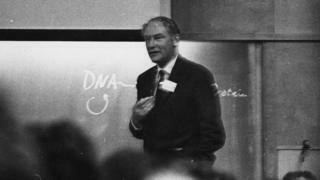 Sixty years ago this week, one of the greatest British scientists, Francis Crick, gave a lecture in London in which he accurately predicted how genes work, setting the course for the genetic revolution we are now living through. Here, evolutionary biologist Professor Matthew Cobb from Manchester University unpicks the predictions that set a new course for how we understand the very stuff we are made from. In one lecture, it has been said that Francis Crick “permanently altered the logic of biology”. Only four years earlier, he and the young American Jim Watson had solved the double helix structure of DNA, using data gathered by Rosalind Franklin. Aged 41, Crick was still five years away from winning the Nobel Prize for this work, but he had a reputation as a powerful and profound thinker. He gave his lecture – “On protein synthesis” – at University College London for the Society for Experimental Biology. In it, Crick spoke about how genes do what they do. At the time, this subject was still very murky – some scientists were not even convinced that genes were made of DNA. But Crick delivered four predictions about genes – and their link to the proteins that build our bodies. In each of these ideas, he was right. Crick started with the main thing that genes do: they control the production of proteins. The problem Crick explored was that the DNA in a gene is simply a chemical code – a string of something called bases – A, C, T, G.
Crick had to explain how the cell could get from this one-dimensional sequence of bases in DNA to the complex three-dimensional structures of proteins. Even more puzzling was the fact that proteins can fold themselves into nearly any shape. Crick’s answer was simple: the order of bases in the gene – what he called “genetic information” – corresponded to the order of the amino acids that make up each protein, and nothing more. There was no structural information about the protein that was encoded in the gene, he claimed. He called this the sequence hypothesis. Somehow, the cell “read” the information in the gene and assembled the amino acids together like beads on a string. The resulting protein folded itself – spontaneously – into its final 3-D structure. We still cannot easily predict the structure of a protein from the order of its amino acids, but Crick’s sequence hypothesis holds good. To explain how exactly cells assemble proteins, Crick predicted there must be some small molecules – he called these “adaptors” – that could recognise each of the 20 different amino acids in the body, and would bring them to where they could be turned into a protein in the right order. As Crick gave his talk in London this molecule was being identified in an American laboratory. It is now called transfer RNA. It is the biological messenger that reads and “translates” the genetic code in the cell’s protein-building factory. The most controversial and influential part of the lecture though was what was called the central dogma. Crick explained that as proteins are synthesised, information is taken from the DNA molecule, first into an RNA molecule, and is then used to make a protein. Before the lecture, he drew a little diagram to explain what he meant. The arrows show what Crick called the flow of information going from DNA to RNA to protein. DNA and RNA could also copy themselves, so there are also arrows going from DNA to DNA and from RNA to RNA. Because the experimental data were not clear, Crick accepted that it might just be possible that DNA could directly lead to the production of proteins, so he drew an arrow there, too (this is not in fact the case). The most important point was that, as Crick put it, once the information had gone from DNA into a protein, it could not get back into your DNA. There was no biochemical route for a protein to change your DNA sequence. Crick thought it might be possible for information to go from RNA to DNA, and this later turned out to be the case, when it was discovered that some RNA viruses can get into our DNA. But the route from protein to DNA is impossible. This central dogma emphasises that our DNA sequence cannot be changed by our proteins, or by how they are changed by experience. Over the last 60 years this has proved to be correct. Despite the excitement about what is called epigenetics, which explains how genes can be turned on and off by the environment, this never leads to a change in our actual DNA sequence. Crick’s dogma was absolutely right. Crick later cheerfully admitted that when he coined the phrase, he didn’t know what a dogma was. What he really meant was that it was a basic assumption about how genes worked. Whatever its name, it still guides scientists today. Crick’s final brilliant prediction was to suggest that in the future biologists would use sequence data to understand evolution, by comparing the sequences of different species. In 1957, when Crick was speaking, protein sequences were known from only five species, while DNA sequencing was science fiction and 20 years in the future. But this is exactly what happened, and we can now understand how organisms evolved in unprecedented detail, by comparing their sequences, just as Crick suggested. Crick’s lecture, which was published the following year, continues to be read and cited by scientists all over the world. It is a monument of clear and penetrating thinking by one of the 20th century’s greatest minds. In all his key predictions, Francis Crick was right, and he did indeed change the logic of biology.